Parmiter: What do you see? Metbaum: A big, black bug. The finest element to the 1975 mutated cockroach flick Bug is a writing credit by horror director William Castle (13 Ghosts, The Tingler), in a screenplay based on a novel by Thomas Page. I have not read Page's book The Hephaestus Plague, but I hope there was more of a story there than what Castle eventually adapted for the screen, because Bug takes forever to ramp up to the core storyline before dipping into what can only be considered surreal absurdity. Following a particularly rough earthquake in a dusty California desert town, a new breed of insect arises out the jagged crevasses and, for reasons never really explained, have the ability to shoot flames out of their rear ends. These mutated cockroaches soon take up residence in exhaust pipes everywhere, causing mysterious explosions all over town, and it takes a diligent entomologist named Parimiter (Bradford Dillman) to make the connection. The downside for Parmiter is that he eventually becomes a bug-studying/pressure-chamber-experimenting recluse who dabbles in his own brand of crazy genetic engineering with the expected tragic results. 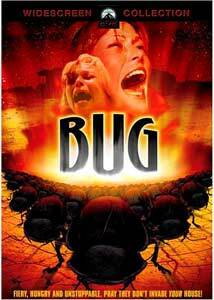 Directed by television veteran Jeannot Szwarc, Bug suffers from a tolerable B-movie horror premise—but the pacing of the Castle screenplay is agonizing and interminable in reaching the goofy final act, which is so ridiculous and comical in design that the loose explanation (no matter how far-fetched) just seems painfully ham-handed. Dillman gets to chew up a few miles of scenery as his character slides into the dark side, but one can only muster so much moody drama out of talking into a tape recorder and peering into a homemade pressure chamber. In hindsight, William Castle probably had the best of intentions with his Bug screenplay, but somewhere, somehow, a salient and satisfying narrative was just lost. The fact that the bugs burn a few folks (time for the obligatory bad flame suit—especially Joanna Miles, who ends up looking like a lineman for the Bears) seems just woefully dull; the big earthquake sequence that opens the film actually has more suspense than any part of the remaining 90 minutes. Bug barely is able to walk the walk, and considering it barely manages to talk the talk there ends up being not much left to either be scary, suspenseful or even acceptable. Mr. Castle, I will always remember 13 Ghosts and The Tingler with great affection. Bug—well it's best if I just try to forget. Image Transfer Review: For a B-movie from 1975, the 1.85:1 anamorphic widescreen transfer is tolerable, looking far better the first two-thirds than it does during the final reel. Colors look surprisingly warm and natural, but the tendency for grain and specking late in the presentation mar an otherwise just-above-average transfer. Audio Transfer Review: A solid mono track in English is available, and while it operates well within the limited dynamics, dialogue is readily discernible and clear. Extras Review: Paramount has decided not to bug anyone with extras, so there is nothing to be found here. The disc is cut into 11 chapters, with optional English subtitles. This is all setup with no payoff, and the required leaps in faith and logic are too gargantuan to completely ignore, even for B-movie horror standards. The slow dip into dementia by Dillman is a decent performance, but the lack of tighter story makes this all talk and very little action.